One weekend in July, I went alone on a day trip to Mount Mabilog and Lake Pandin in San Pablo, Laguna. This has been a long time in planning, postponed a couple of times due to my inability to wake up before 7AM in the morning. However, since the last weeks had delivered overcast skies and thunderstorms, I itched to get a little time off from the house and hopefully bask under a happy sun. Thus the determination to get up early and head to Laguna. All photos are taken using my beloved second-hand camera-shutter-noisy Samsung Galaxy S5. I rode a bus in Buendia and arrived in Lake Pandin in Laguna about 3 hours later. There were makeshift souvenir stores and tables in the lakeside. The locals there were friendly and I approached one. I explained that I have a reservation for lake rafting but would trek to Mount Mabilog first, an easy-climb forested mountain standing next to the lake. In the single Mount Mabilog and Lake Pandin itinerary that I’ve bothered to looked up online, it says going to the summit and back only takes about 2 hours. The summit supposedly offers views of two of the seven crater lakes in San Pablo: Yambo and Palakpakin. I thought, 2 hours can’t be that bad. My guide and I started trekking. I then confirmed about the distance and was told that it takes 1.5-2 hours going to the summit and then another 1 hour going back. Obviously I made a mistake in estimation. I didn’t even bother getting a proper good night sleep or breakfast that morning. I tired easily and felt light headed. Thrice on the way to the summit, I told my guide I wouldn’t be able to go any further. At one point I felt like throwing up. My guide harvested some leaves from a nearby tree called Litlit, crumpled it and gave it for me to smell. It worked miracle, and after a few minutes I was already good to go. As good as I was going to be anyway. After some more laborious minutes, we’ve reached the summit. It’s a small grassy clearing, with a view of the green mirror that is Yambo Lake and the brownish Palakpakin Lake. I dropped my light backpack on the ground and laid on my back. In normal circumstances, Mount Mabilog is an easy climb, even more so than the beginner’s favorite Mount Batulao in Batangas. It’s a small triumph for me to make it to the summit given my lack of preparation. There were only two other groups in Mount Mabilog that day. Another party would arrive, but that would be much later on. It’s astonishing that there weren’t many more visiting mountaineers, unlike in other mountains near Manila, such as Batulao, Pico de Loro and the recently opened Mount Maynoba, where groups of mountaineers congest in the summit and form queues in the trail. Perhaps this low-popularity score is due to the relatively simple view in the summit of Mount Mabilog: there are no sea of clouds or mountain ridges in the distance. But I liked it there. It wasn’t crowded, the Yambo Lake looked serene and beautiful. Beyond that I could see Mount Cristobal, also called devil’s mountain, and beside it, Mount Banahaw, considered a holy mountain. I wondered if there’s any significance in this geography. I played with a cat that was prowling in the area, and after about 30 minutes of rest, I told my guide I was ready to go back. When we arrived back at the lakeside, many of the locals looked up and there was a chorus of cheerful greeting, “Oh look she’s back!” “The woman who climbed alone!” I wanted to hug them all. My guide earlier told me that Lake Pandin is crowded on lunch time during weekends, and this is what I’d read online too (from the same person I’ve gotten my itinerary from). But it wasn’t. It was quiet and there were only a handful of other guests. Perhaps it was only for that day. It’s saddening because Lake Pandin deserved more public attention and also selfishly wonderful because it means this place can still be relied on for a quiet weekend. Surrounded by greens and quiet. I had my lunch on a cottage, and the meals were delicious. In fact, I enjoyed it better than the seafood buffet lunch offered in tours in El Nido, Palawan. The food was simple yet flavorful and given in generous serving. There was two cups of rice (I suppose the lunch + rafting packaged I availed is for 1-2 people), sauteed small shrimps, fresh fern salad and grilled tilapia and pork chop. I love the shrimps the best and wish I knew how they cooked it. I love the small-shrimp dish and fresh seaweed salad. Afterwards, we rafted to the other side of the lake and I spent a good two hours swimming in the deep-green water. Unlike in beaches, it’s difficult to see anything beyond my own arms when swimming in the lake. One of the boatmen said the lake is about 180 feet deep and that there are fishes underneath. In one spot, there are lovely swings attached to tree branches, which you can use to jump directly to the water. In another is a grotto beside a drinkable spring. The boatman said it has been there way before they came into the lake. I think I’ve already said my sentiments about Mount Mabilog and Lake Pandin. These two deserve more attention, but I guess the fact that it hasn’t attracted the eyes of the growing number of tourists and the selfie-loving generation is a blessing in disguise. In the years to come, it’s highly probably for these to be established getaways, especially for weekend travelers. On the day of my visit though, Mount Mabilog and Lake Pandin are still a tranquil haven. There are better mountains than Mount Mabilog of course if one is after majestic summit views, but this mountain offers seclusion and quiet that is rare in destinations near Manila. In addition, I also like how there seems to be a camaraderie, a harmonious relationship between the members of the cooperative who are looking after the guests, both mountain and lake visitors. Very much unlike other locations where locals are in stiff competition with one another. Before I left, we had a good hour of strong rain. The locals complained at the newly constructed wall in front of the lake, with drainage pipes that spurt out streams of mud to the tables and the lake itself. I suggested that they go file a report to the local government. One answered they already did but the farm owner who ordered the building of the walls has friends in the local government and that the locals’ effort was for naught. I don’t know if this is true, but it saddened me. Many times I’ve witnessed how spots in the Philippines have been damaged due to lack of environmental responsibility, corruption in different levels of the government and so on. I hope Lake Pandin remains a quiet sanctuary for the years and decades to come. 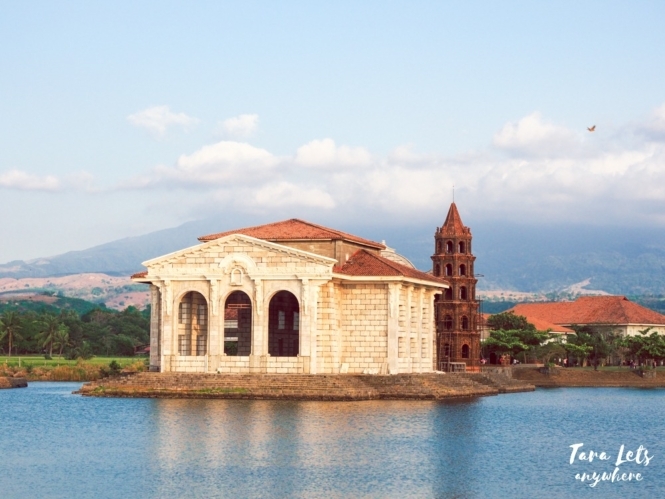 Here’s a sample Mount Mabilog and Lake Pandin itinerary for one day. You can even visit the nearby Bunga Falls after. If you’re solo, prepare a budget of about P1500 for a one-day Lake Pandin itinerary. The package rate for Lake Pandin is smaller for groups of people. If you want to visit Bunga Falls, you can hire a tricycle for P200 one way. Aside from the home-cooked lunch, there are also fresh coconut available and desserts such as leche flan and halayan ube. I got a floating cottage even though I was alone. I initially considered the small raft, but it looked uncomfortable. The small raft is essentially 5-6 pieces of bamboo pipes tied together. There’s no seat obviously and no roof either. If you have a backpack, you can ask the locals to look after it in the lakeside tables or houses. There’s a comfort room in the area but it’s only used for changing clothes. Washing up is done on the poso outside. We’ve been here last weekend and we loved the place! Hallo Mark. 🙂 There’s a number of the contact person at the end of the post. I honestly don’t know! Haha. I tend to use “trek” more loosely and then “hike” when referring to mountain climbing. Sabi nga, try and try until you succeed. It may be an overused statement but it is indeed still true! You pushed yourself really hard for that climb and glad you got a guide who’s very helpful all the way, offering you a remedy with your uneasiness during the trip. People like that are a blessing. This place as well. Wow! It looks beautiful! I learned something new from your post today. It’s good that you felt better after he gave you those leaves to smell. I also like it when the places I visit are less crowded. i have wanted to go to the Seven Lakes for forever! But i havent heard yet of Mt Mabilog. I’m not really good with mountains too so I will definitely heed all your advice when I reach Pandin and Mabilog. Thanks for sharing! the trek is worth the climb! With this lake padin after all the struggle, an hour or two of trekking won’t be a problem at all! It’s just that, I can’t dare going on a trip alone. Ha! I am not just into it, maybe. But nonetheless, I am sure that you really enjoyed your stay here. I love your picture of Lake Yambo. Beautiful. Sounds like a nice but tiring walk :). And great that it wasn’t too crowded. Great for making pictures! Lake Pandin is lovely as well. I totally love the swings!! I hope as wrll that it will stay clean and quiet. I haven’t been to Pico de Loro but considering the said difficulty of its monolith I’m guessing Mount Mabilog is a much easier climb. Though if you want better views I’m recommending Mount Batulao. I haven’t been to Mt. Mabilog yet but I remembrr going to Lake Pandin back in High school and from one of my classes in college. The lake was magical and clean.